Introducing a brand new concept in diaper creams and baby lotions. How can you put cold creams and lotions on someone so soft and warm and helpless? 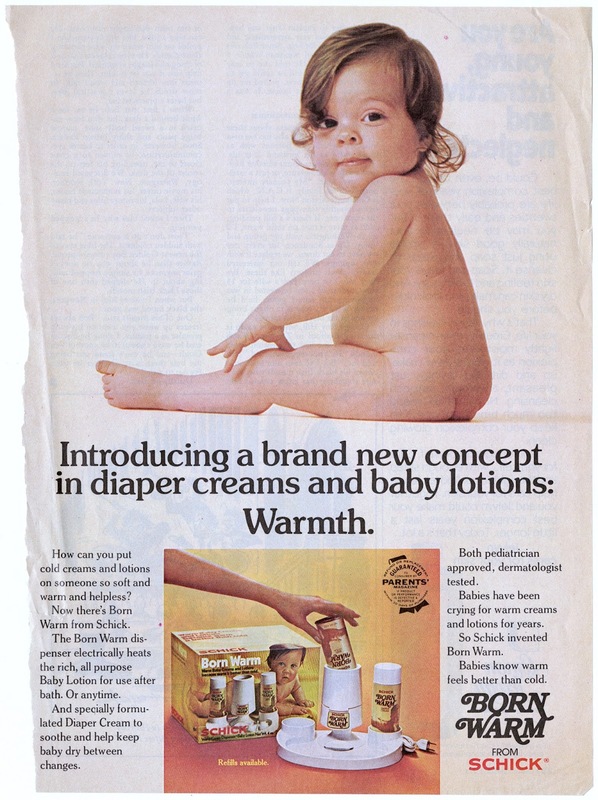 Now there's Born Warm from Schick. The Born Warm dispenser electrically heats the rich, all purpose Baby Lotion for use after bath. Or anytime. And specially formulated Diaper Cream to soothe and help keep baby dry between changes. Both pediatrician approved, dermatologist tested. Babies have been crying for warm creams and lotions for years. So Schick invented Born Warm. Babies know warm feels better than cold.